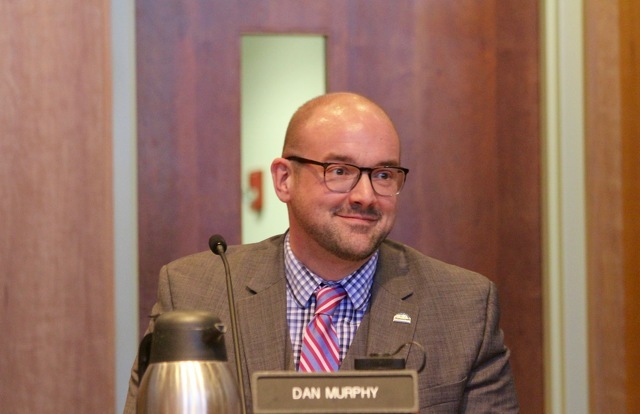 He's the newest and youngest member of State College Borough Council, and Dan Murphy believes he will bring a perspective that's been absent for several years to the borough's governing body. The 35-year-old director of Penn State’s Office for Student Orientation and Transition Programs was sworn in for his first term on Tuesday by Centre County President Judge Pamela Ruest. Theresa Lafer and Evan Myers, who were reelected in November, joined Murphy in taking the oath of office, along with new mayor Don Hahn. Murphy, who moved to State College in 2012, campaigned in part on the idea that as a young professional and renter he would bring a fresh viewpoint to borough government. He won one of the three Democratic nominations in May's primary, along with Lafer and Myers, as well as a Republican nomination through write-ins before being elected in November. He said on Tuesday that he's eager to learn from his fellow council members, borough staff and the community, but also to bring his perspective to council's decision-making. "I’m excited to provide a perspective on council that I think hasn’t necessarily been reflected over the last few years," he said. "I think my role on council will be to provide the perspective of your young professionals, your renters, your people that move to State College for work and then make it their home. I’m excited to provide that lens to the conversation and that thoughtful consideration in our decision-making process." During the campaign, Murphy also heard most often from long-time residents who felt left their wishes weren't always reflected in borough council's decisions. "I think representation broadly is what they’re looking for from borough council and thinking about it not just from the impact things might have downtown or as a result of relationships with the university, but also what that impact looks like deeper into the community, out into the neighborhoods," he said. Looking ahead, he sees challenges and opportunities. Like Hahn, he recognizes town-gown relations as a priority and said there are conversations to be had about the relationship the borough has with Penn State. "I think there’s a strong desire to make that relationship as positive as possible and I’m eager to contribute to and help grow that relationship so the beautiful aspects of this community can all come together and work well together," he said. 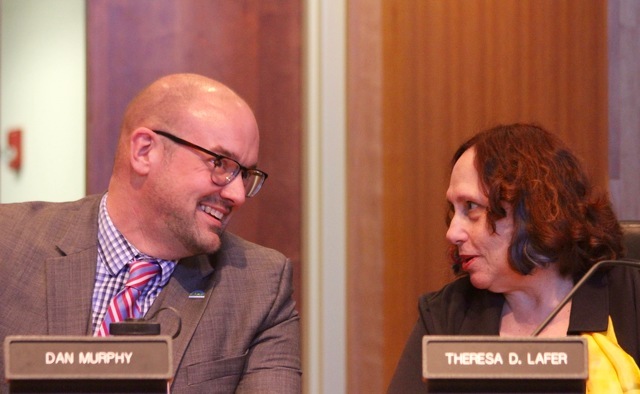 Dan Murphy talks to fellow borough council member Theresa Lafer prior to council's organizational meeting on Tuesday. Photo by Geoff Rushton/StateCollege.com. The future role of fraternities in the community will be another ongoing discussion, he said, and he plans to bring fraternity members into the conversation, "so we can have a good community dialogue about what the future of fraternities in State College looks like." Planning and zoning are other major issues facing the borough, Murphy said. Council will undertake a major rewrite of the borough's zoning ordinance this year, and downtown development and the changing landscape of State College will continue to be major topics of discussion and areas for decisions by council. "I think the conversation about development is not over," Murphy, a resident of the Orchard Park neighborhood, said. "We continue to get more requests for consideration about what downtown could look like and maybe even a little beyond what downtown could look like. A native of Lansing, Mich., Murphy received bachelor's degrees in music and organizational community from Western Michigan University and a master's degree in counseling psychology from James Madison University. Before coming to Penn State, he held student-focused administrative positions James Madison and Indiana University. Like Myers, who on Tuesday was elected council president, Murphy was endorsed by BugPAC, a local political action committee launched by former Penn State student government leaders that aimed to gain greater representation for student concerns in borough government. Murphy has been a regular presence at borough council meetings even before taking office on Tuesday. He said he has received a warm welcome from fellow council members. "I’ve reached out to them for guidance and education around the issues that are coming our way," he said. "There’s no doubt the fact that I’m going to be the youngest member of council and I represent the Millennial generation and the way I view the world are probably at times going to contribute some opportunities for discourse in council meetings and in conversations that help move us forward." He expects that different perspective to be a benefit to everyone in the borough. "I’m really looking forward to working with [other council members] and learning from them, but I also look forward to sharing my insights and the perspective of someone who is in a different life space than most of them are. I think that will be very valuable for the residents of State College." Penn State wrestling crowned six individual champions on Tuesday and finished first in the Southern Scuffle with a team score of 197.0 points, well ahead of second place Northern Iowa’s total of 127.0 points. During the two-day wrestling marathon that kickstarted the new year on Jan. 1 and 2, Penn State’s 18 wrestlers went a combined 56-19 with 22 pins.